Scott Aarssen says Fife Flyers need to show more consistency as they battle to move up the EIHL standings. The D-man wants to see the Kirkcaldy side put together a winning streak, starting this weekend with games against Guildford Flames and Nottingham Panthers. The last time the Flyers celebrated a double-winning weekend was back on October, 13-14 – and in recent weeks they have fallen into a frustrating pattern of a win and a loss. The 30-year-old says that such inconsistency is something that the team are well aware of. “We’ve noticed that trend for a while now,” he said, “we’ve talked about trying to string together more than two or three wins and getting on a bit of a streak. “We’ve talked about approaching the weekend and getting two solid wins. “That will become valuable down the stretch, especially when if you make the first round of the play-offs when you’re playing that two-game aggregate every game. “We’ve got to string together six solid periods of hockey every weekend over the two games, and not just show up for three of four periods. “So we need to find that level of consistency and that’s what we’ve been talking about a lot as a group. Aarssen is also unhappy with amount of goals the team have been losing of late, particularly with the seven goals scored by Manchester Storm on Sunday night. “Over the past few weeks we thought we’d tightened up in our own zone,” he said. “You can look at it more broadly – it’s more than just playing in your own end. Defence starts as soon as you lose the puck in the other end. “Any time you give up seven goals it comes down to team defence. It was nothing to do with Shane Owen – he’s an outstanding goalie for us. “There are so many aspects to it, whether it’s assignments, back-checking and D-zone as well. “It comes down to discipline, working hard and having that extra effort level. That didn’t seem to carry on through the entire 60 minutes on Sunday and you saw the end result. “We do need to tighten that up. We can’t be giving up that many goals and expect to win games, it’s as simple as that. “We need to get back working hard this week in practice and really bore down on the small details in terms of defence. You can’t be just thinking about it once the other team gets a scoring chance. Looking ahead to this weekend Flyers begin with another road trip, making the long journey to Surrey to play Guildford on Saturday, before making a welcome return to the Fife Ice Arena to face Nottingham 24 hours later. “Guildford are a very skilled team,” he said, “they have a lot of offensive power and like to skate the puck, but we’ve played them well this year so far, but obviously we can’t take them lightly. 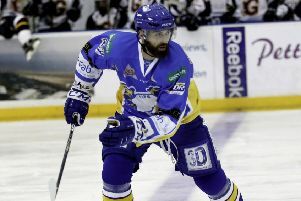 He added: “Nottingham is going to be a massive game. “They’re right above us in the standings but we have games in hand we have to take advantage of because we could leap frog them if we keep putting wins together. “Playing the team we are trying to chase down is basically a four point game and those are the most important ones, especially at home.